Travel Document Holder - Available in a completely custom version or for smaller orders choose one of our stock designs. Either way, it's a great way to remind customers of all the services you've provided as well as keeping all your contact information at their fingertips. 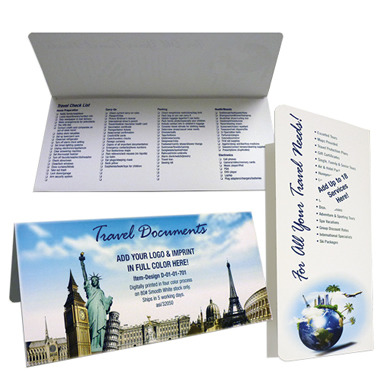 Add your company information and logo to the already designed Travel Document Folder. Item numbers: 01-01-055: 4 1/2 x 10 1/4 closed. Printing: Choose one of our standard ink colors. Print up to 6 lines of copy. Approximate size of imprint area is 2 1/4 x 3 1/4. See bottom of page for standard ink colors, paper colors and the most up to date travel checklist. 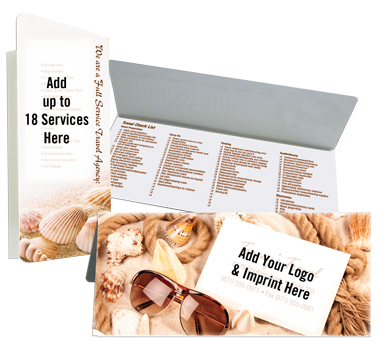 Ask us about our New Customer discount when ordering a custom document folder! 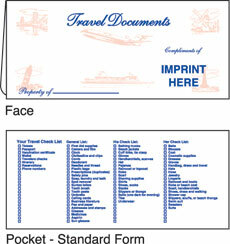 Add your company information to the already designed Travel Document Folder. Item number: 01-01-002: 4 1/2 x 10 1/4. Printing: Your company information prints in our standard blue ink (only option for imprint). Only available on white marble crush paper stock with red "icons". Print up to 6 lines of copy. Approximate size of imprint area is 2 1/4 x 3 1/4. Item numbers: 45-01-055: 4 x 9 closed. Printing: Choose one of our standard ink colors. Print up to 6 lines of copy. 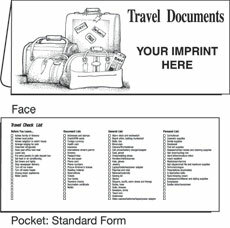 See bottom of page for standard ink colors, paper colors and the most up to date travel checklist. 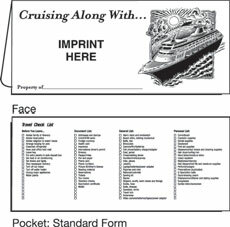 On this design, the checklist is split up, two columns on each side. 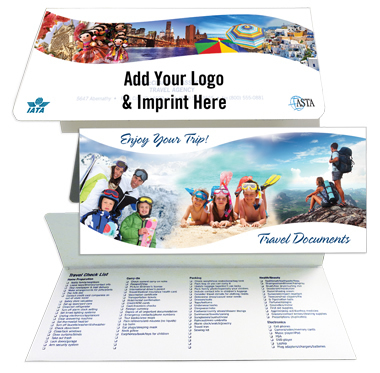 Full Color Document folders now available in small quantities! Printing: Stock design and your imprint copy prints in four color process. See bottom of page for the most up to date travel checklist. Standard paper and ink colors for document folders shown below. Numerous additional paper stocks and ink colors available for custom document holders at an additional cost. Please call 800-343-0583 for more information. 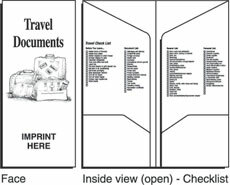 Here is the standard travel checklist on our document folders.